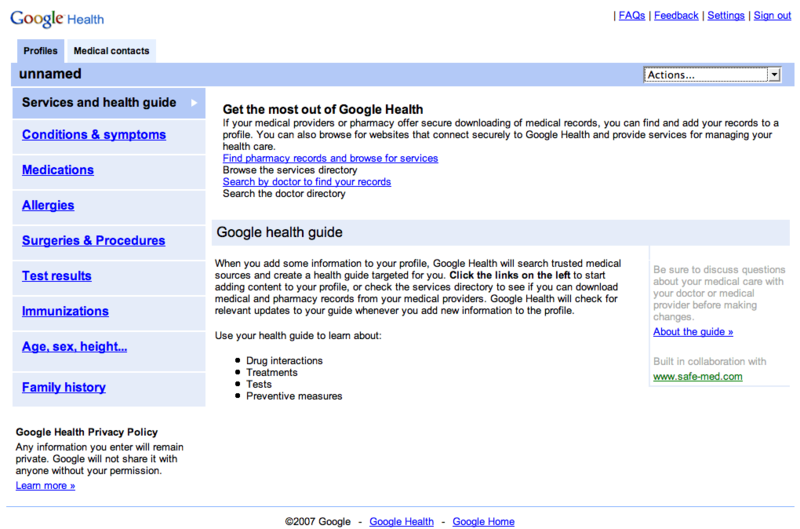 Based on the ten screenshots available at Lenssen’s site, this preliminary version of Google Health is indeed laser-beam focused on creating a personal electronic health record — a digital version of the paper files your doctor probably keeps in one of those vertical filing cabinets. Given the unlikelihood that users will be able to simply upload their information from their doctor — as I seem to be repeating a lot these days, fully three-quarters of U.S. doctors still keep medical records on paper — the initial emphasis is on getting users to enter as much of their personal information as they feel comfortable providing. 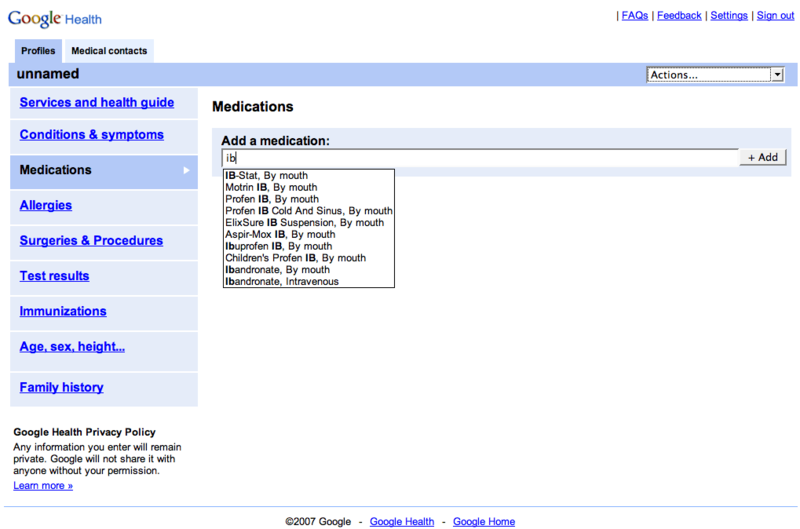 The remainder of the preview site is fairly straightforward so far as health information goes. 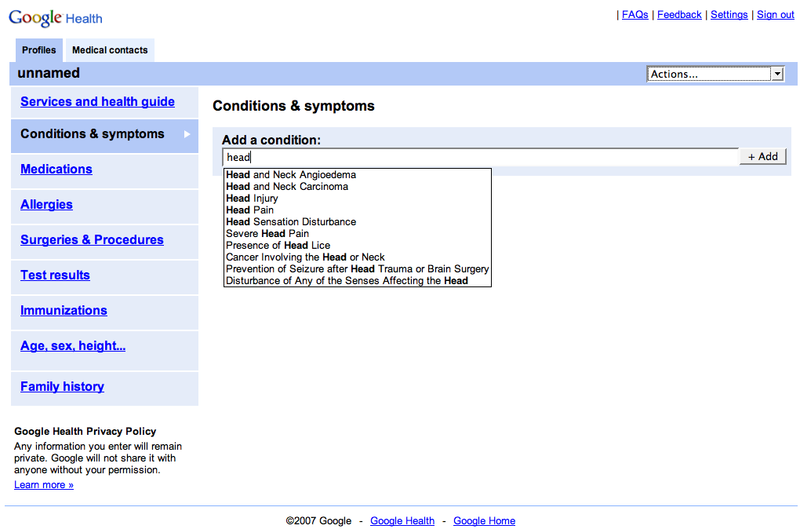 The “Medical Contacts” page turns out to be a blank box that offers the option of searching the “Google Doctor Directory” to add your current physician or physicians. There’s no sign as to whether that directory actually exists or not, or whether it will be compiled with human oversight or automatically assembled in the fashion of other Google directories. Overall, it seems a solid but unremarkable effort, one that probably wouldn’t even merit much attention were it not from Google. Of course, that makes all the difference, since a groundswell of patients who want their doctors to use Google medical records might actually encourage more doctors to adopt electronic systems. In the meantime, for comparison, you might check out some other early efforts to do something similar, such as the OpenHealthRecord or the more sophisticated but less user-friendly HealthCapture PHR. UPDATE: Tom Salemi of the In Vivo Blog has an even more dyspeptic take on both the NYT story and the Google Health preview — not to mention a decent joke based on one of my favorite bands — here. UPDATE REDUX: Another underwhelming review is up at MedGadget, while at Over My Med Body!, Graham Walker — a third-year Stanford med student — rails that “Patients should not control their medical record,” and then explains why. The comments to Walker’s post further expand on the issue of just how good an idea it is to let people enter their own medical information, and whether that should complement doctor-provided information or even override it if the patient so chooses.